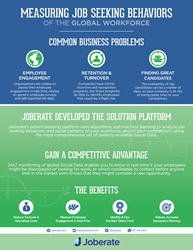 The API integration between Macromicro’s HR Analytics and workforce data-discovery platform and Joberate’s global people directory of job seeking activities (J-Score™) enables organizations to combine internal HRIS and other workforce-related data with external job seeking behavioral analytics extracted from Social Media data, thereby gaining access to real-time, actionable business insights. Joberate™, the world’s first and only technology platform that monitors and measures live job seeking activities of the global workforce leveraging publicly available Social Media data, and OrgInsight, Macromicro’s secure, cloud-based, HR Analytics and workforce data-discovery platform for business users, announce a strategic partnership and an API integration between the two platforms. The combination of the two platforms enables organizations to combine their internal HRIS and workforce-related data with external job seeking behavioral analytics, which are extracted from Social Media data, to simplify the HR analytics experience by displaying all an organization’s employees, and their relationships in a single, interactive user interface. Macromicro’s clients can now access Joberate’s global people directory of real-time job seeking activities quantified into a single metric called J-Score™ within OrgInsight’s HR Analytics and workforce data-discovery platform. Seeing all organization’s employees in both the macro, enterprise context down to the micro, individual level allows managers to uniquely manage their organizational complexity. The integration equips an organization’s leaders with information they need to do evidence-based, data-driven adjustments, which stem from global market pressures on talent management, while maintaining organizational design agility. According to a Center for American Progress study, the cost to replace a worker, depending on their skill set, can range from 10%-30% of their salary, while the cost to replace executives and other niche roles can be as high as 213% of their salary. In total, voluntary attrition represents a $350 billion global problem that businesses must address strategically. At the same time companies spend more than $400 billion globally on staffing services, in an effort to attract and recruit top talent, with $124 billion of the global spend occurring in the U.S.
Social Media has enabled society to identify and apply for new opportunities nearly effortlessly, which presents both challenges and opportunities for talent acquisition and HR teams that are charged with retaining and recruiting top talent; voluntary employee turnover, time to hire, quality of hire, and cost per hire are typical key performance metrics. Joberate and Macromicro have developed an integrated toolset that allows organizations to capitalize on real-time talent analytics to affect a strategic shift towards data-driven talent management, marketing, and communications. The Macromicro and Joberate API Integration represents an immediate competitive advantage for organizations that are considering moving towards a unified workforce analytics platform, as opposed to trying to self-manage a burgeoning stack of ad-hoc SaaS applications that fall short of expectations. For additional information about Joberate and Macromicro technology platforms, please visit http://www.joberate.com and http://www.macromicro.com. Joberate’s mission is to help society better understand job seeking behaviors of the global workforce, while organizations will leverage Joberate’s global platform to power a whole new generation of real-world business applications. Organizations are using the Joberate platform to help with retention and recruitment of talent, as an alternative credit scoring methodology, in financial hedging and risk management, succession planning and M&A integration, to gather market data and perform research, and sales and account management. Joberate’s technology platform is available to API partners for integration into leading CRM, HRIS, ERP, Talent Management, ATS, and Financial applications. Joberate won the 2014 iTalent technology competition, hosted by HRO Today Forum, from a prominent field of finalists including Glassdoor, Jibe, Smashfly, and 1-Page. In 2013 the company was named a finalist at the UK National Online Recruitment Awards competition in the category of Best Innovations in Online Recruitment along with prominent companies like LinkedIn, and Joberate was recently shortlisted by SAP for the “Big Data Startup of the Year” award. Macromicro is recognized for its innovative HR Analytic and data-discovery solutions and the empowering effect of its data visualizations. Based on a blend of business insight and design thinking, Macromicro enables new forms of organizational insight and analysis through interactivity, clarity, and data-density. OrgInsight helps companies visually explore, quickly learn and contextually understand patterns, trends, hotspots easily missed with analytic traditional methods and spreadsheets. In 2013 the company was nominated in Best New Innovative HR Technology category at the HR Tech Europe competition, and Macromicro was recently considered for the “SAP Startup Focus HANA Innovation Award 2015” award. SAP customers can download OrgInsight on the SAP HANA Cloud platform here.